As Hofstra senior defender Marcus Lindqvist prepared for a corner kick, Stony Brook Men’s Soccer was in need of a clear. 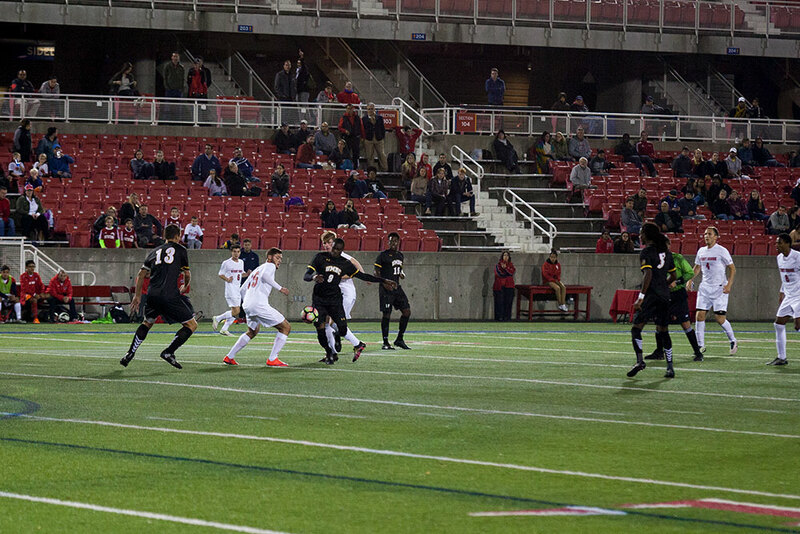 Trailing 1-0 with seven minutes remaining in full time, the Seawolves would have to get the ball down the field quickly and apply pressure in search of an equalizer. Instead, Lindqvist sent the ball in front of the net where sophomore forward Matthew Vowinkel was waiting to bicycle-kick it into the net and put the game on ice. Stony Brook’s 2-0 loss to Hofstra at Kenneth P. LaValle Stadium on Wednesday, Sept. 12 marks the team’s third loss of the 2018 campaign, dropping its overall record to 2-3-1. The first Pride goal came just seven minutes prior to Vowinkel’s backbreaker, also on a restart. Sophomore midfielder George O’Malley fired a shot into the left side of the Stony Brook goal off a throw in, breaking a scoreless tie. Despite the two-goal deficit on the scoreboard, the Seawolves kept the game close in shots and shots on goal, trailing 13-11 and 6-4, respectively. Junior midfielder Mark Irvine led Stony Brook with three shots in the game and one on goal. His opportunity in the 31st minute was one of the team’s best scoring chances, but Hofstra senior goalkeeper Alex Ashton was able to come out of net and make an aggressive save 10 yards from the goal. While the Seawolves’ effort was equal to that of the Pride for most of the game, they found themselves trying to match their opponent’s physicality, an effort that didn’t quite pan out. Stony Brook doubled Hofstra in yellow cards 4-2, and the game quickly assumed a chippy nature. Stony Brook’s next challenge will come on Saturday, Sept. 15 when it hosts the Bryant Bulldogs. The Seawolves will look to end their two-game winless streak against a Bulldogs squad who has yet to record a win through five games this season. Saturday’s game will begin at 7 p.m. at Kenneth P. LaValle Stadium.